How are new rails on your LGB layout transported to the trackmen? 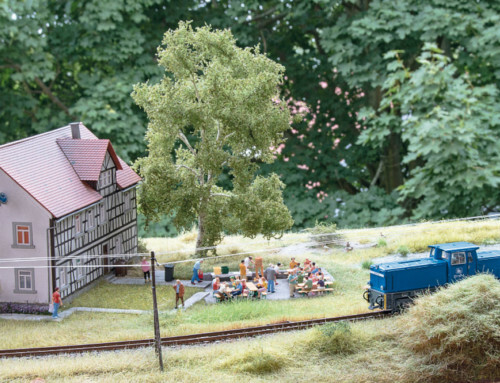 Reinhold Braun has transformed a set of three stake cars into a rail transportation system for narrow-gauge railways. 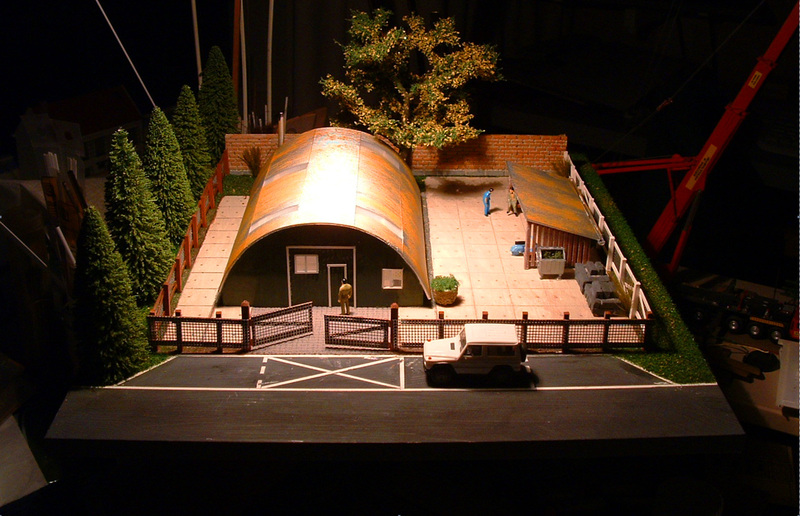 Small prototype large replica: The idea for the rail transport car came from a Marklin HO model (item 45095). 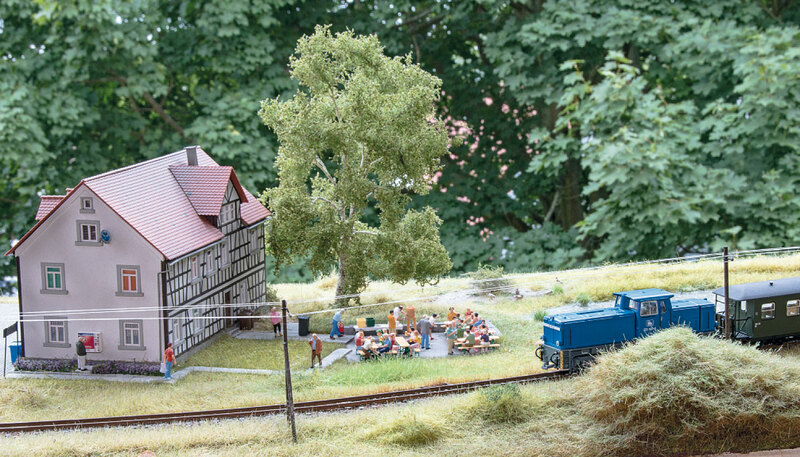 type of a narrow-gauge railway, as is the case for most building tips in LGB Depe­sche, but from an actual Marklin model. 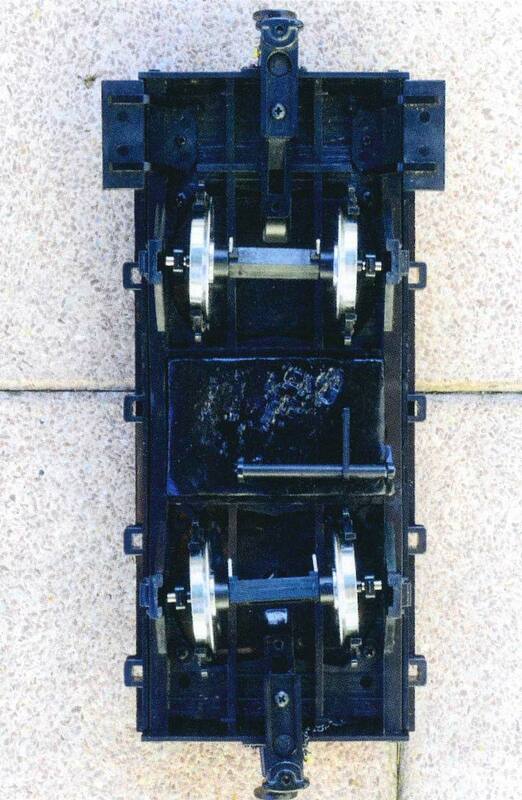 Specifically from the HO car 45095, a set of three flat cars connected to each other by spacer bars. The three connected cars transport long track profiles. Marklin has loaded the cars with eight reproduction rails. 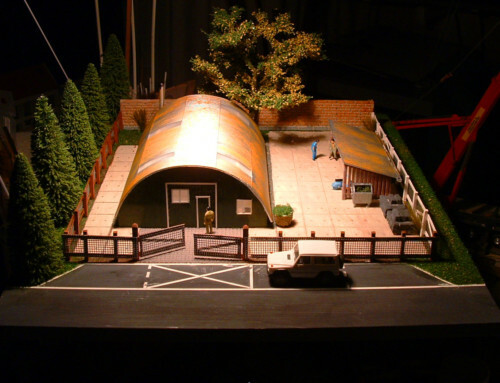 They are made of flexible plastic and are therefore mobile enough to also handle cornering without any problems. 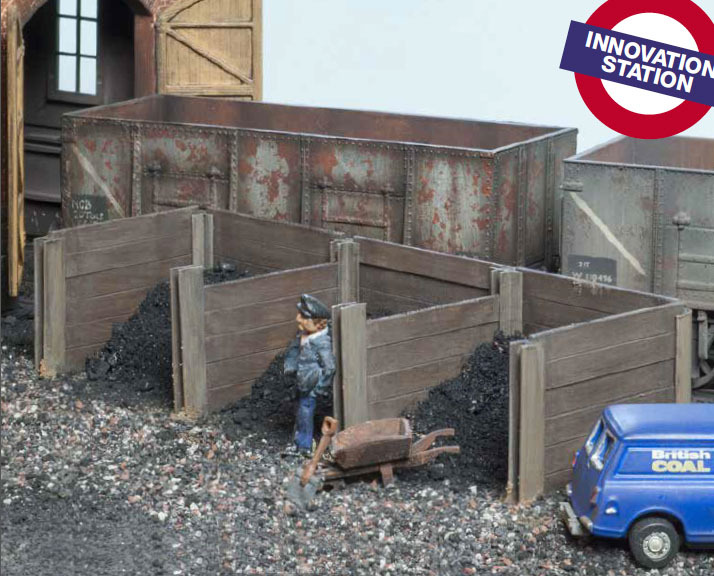 What Marklin offers in HO format can also be created with manageable effort as a three-part rail transport car in G-gauge. Measuring almost 3.3 feet in length, it is quite a sight. 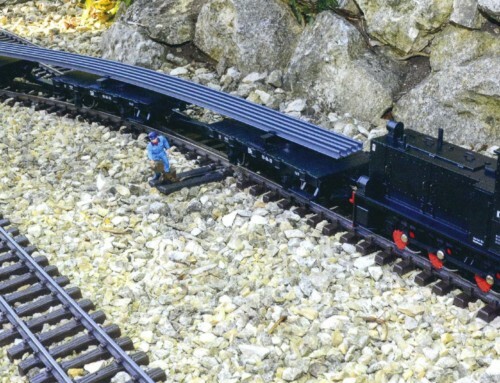 The 9.8″ long LGB stake cars of the Ger­man State Railroad (DR) are suitable as the base material for the rail transport car. Three cars are required. 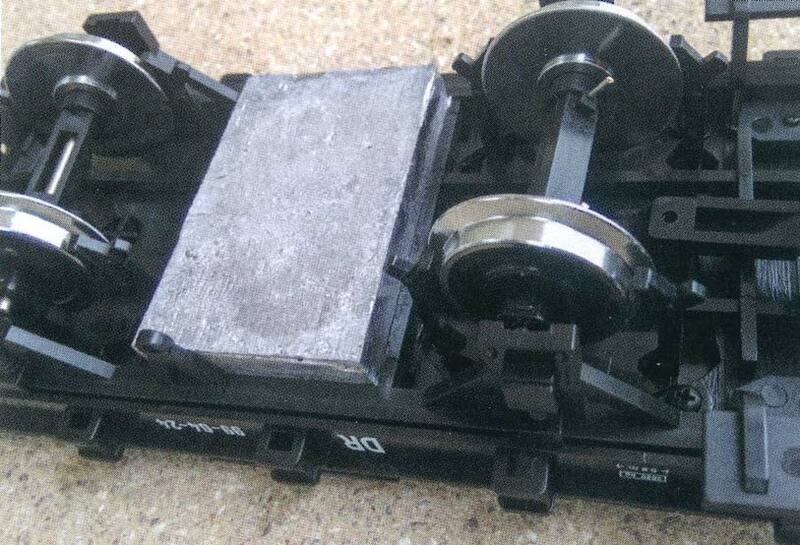 The pivot plates and pivoting arms are taken from the LGB dual flat car (LGB item 4050/40500). The cars are equipped with forest railroad couplers and interconnected by means of two drawbars. The drawbars are manu­factured by Reinhold. Alternatively, plas­tic bars from LGB logging trucks can also be used. Visual details such as a plate with screw heads or dummy rivets can be added as desired. The operating characteris­tics of the long car can be improved through ball bear­ing mounted wheel sets (LGB item 67403). For assembling the carrier plates, turn­table plates, and pivoting arms as well as for further processing of the chassis, the cars and the pivot plates are dismantled into their individual parts and the dummy brake hoses are removed. After the car­rier plates with the pivot plates have been removed from the original model, they are attached to the stake car. For visual reasons, installation is different from the original pivot plate car. The carrier plates are not fitted longitudinally in the direc­tion of travel, but transversely. This en­sures the plate is easier to see on the car when loaded. 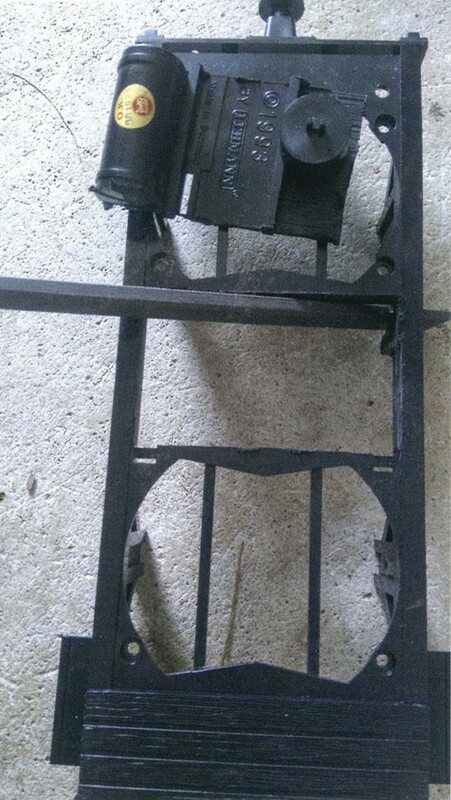 To fix the pivot plate firmly to the car, the carrier plate is not only glued to the pivot plate, but the anchoring pins of the plate are also used. This means the pivot plate is seated more securely on the car. 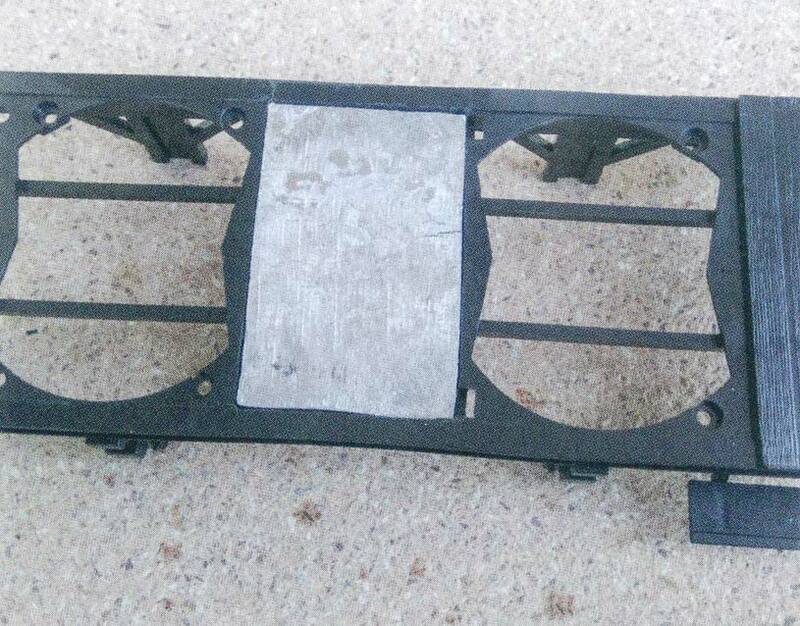 Since the carrier plate with its pins is asymmetrical, installation is somewhat tricky. The use of a light railroad truck superstructure from the dual flat car (LGB item 4050 or 40500) as a drilling template facilitates work. But be careful: The injection molded lug on the truck leads to the assumption that the center point is here. That is not true, it is offset by 0.07″ in the longitudinal axis. A 0.03″ hole is drilled through the center of the carrier plate into the truck superstructure so that the light railroad truck drilling template can be inserted centrally on the stake car superstructure. Subsequently, a hole of the same size is drilled into the center of the stake car superstructure. A small pin is inserted into the stake car hole and then the truck car template is positioned so that the pin makes contact with the drilled hole in the template. The drilling template is positioned at a right angle on the stake car. Precise drilling: In order to be able to ilace the anchoring pins precisely on the uperstructure of the stake cars, the su­ierstructure of the light railroad trucks is sed as a template. The retaining holes for the pins can now be marked on the carrier plate. Using a 0.12″ bit, the holes for the pins of the carrier plate are then drilled into the stake car. 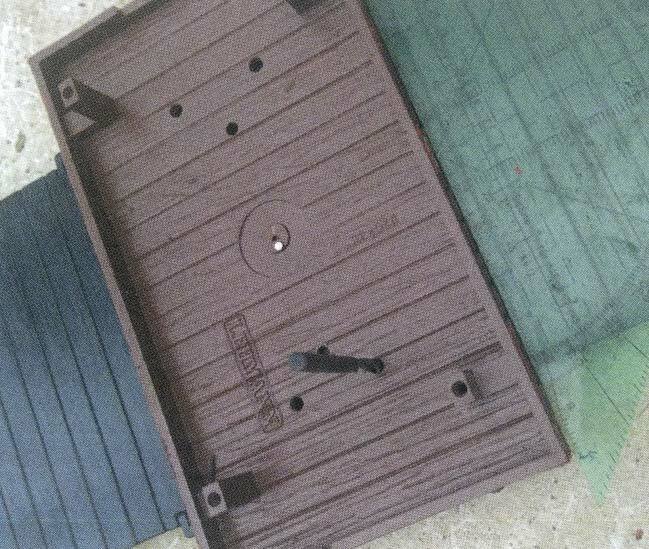 The pins of the carrier plate are inserted into the holes, addition­ally the carrier plate is glued into position on the stake car superstructure using a plastic adhesive (for example: Technicoll TC 8008). sive surface, the excess injection molded lugs underneath the car superstructure must first be ground flat. 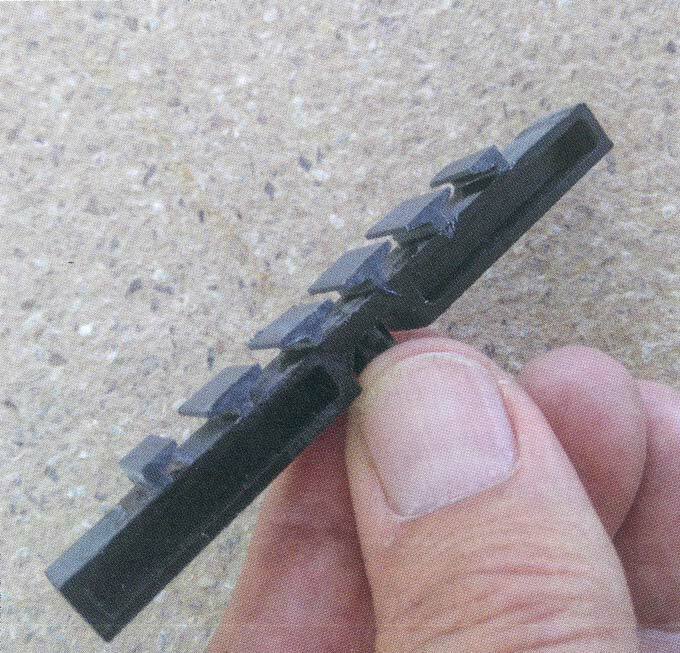 Reinhold Braun uses plastic adhesive to fix the blocks into place. 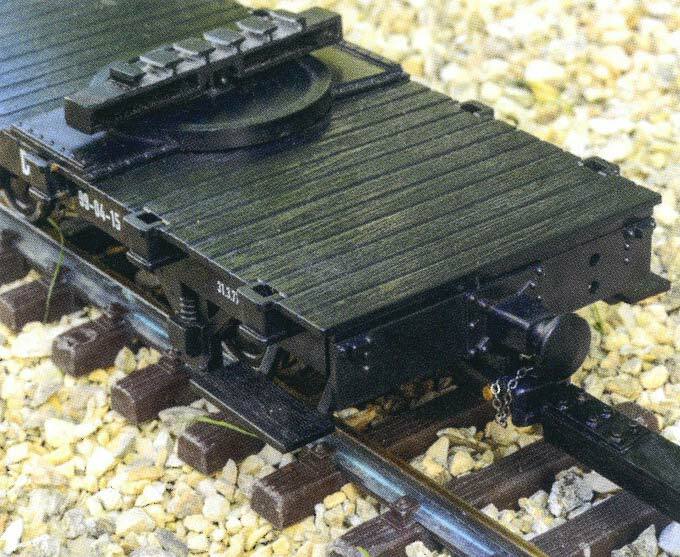 With their additional weight of 1.7 lbs each, the three transport units were able to negotiate the test route featuring curved LGB tracks (radius 3) and also the counter curves with 16000-series switch­es without any problems. However, trial operation with lighter additional weights (0.99 lbs) underneath the cars resulted in problems on the test route. To improve the running characteristics, all three cars are equipped with ball bearing mounted wheel sets. The weight is the key: The additional weight (1.7 lbs) is glued into the cut-out center section of the stake car chassis. The three cars are interconnected us­ing the forest railroad coupler set and two drawbars. They are well suited to this task and look prototypical. When installing the coupler pockets, however, it makes sense to modify the assembly somewhat, as the heads of the coupler pins collide with the central buffers of the cars on the traditional setup. There is a simple trick to work around this prob¬lem: The couplers are mounted upside¬down. This means that they are slightly lower than usual and thus prevent colli¬sions with the central buffers. This meth¬od of installation has no negative impact whatsoever on operation. In addition, the chain of the pin is not attached to the frame as usual but to a small screw be-hind the coupler pocket. The advantage: This allows the entire unit to swing freely in curves. Reinhold made the drawbars himself: I However, if available, drawbars of US tim¬ber cars from LGB can also be used. To make the drawbars, wooden battens of a desired length are required, at the end of which holes are pre-drilled. A u-shaped piece of brass wire (thickness: 0.07″) is glued into them. 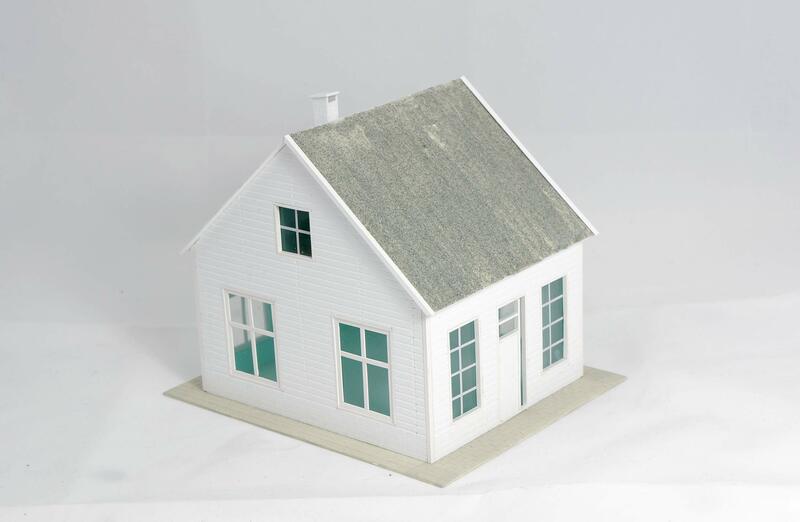 The advantage of DIY construction is that the distance between the cars and thus the overall length of the three-car set can be determined according to your own wishes. 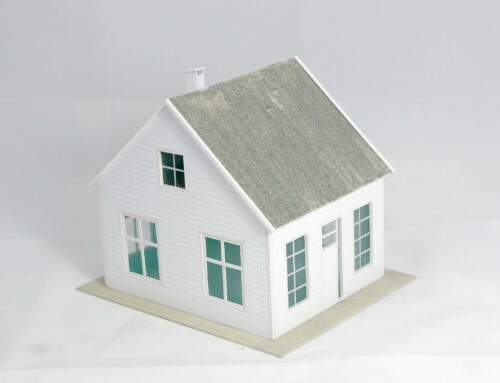 In our case, 3.94″ long, 0.43″ x 0.28″ wooden battens were used. Finishing the bars: The fully assembled drawbars are finally painted matt black with model making paint. Upside-down is the way to go: The cou­plers are mounted upside-down to pre­vent a collision with the central buffer. Load restraint test: The load restraints glued onto the pivoting arms still have to be filed to guarantee the rails have sufficient clearance. Otherwise correct cornering will be not be possible. Flexibility test: Flexibility of the rails within their load restraints on the cars is tested using R3 tracks. flexible. 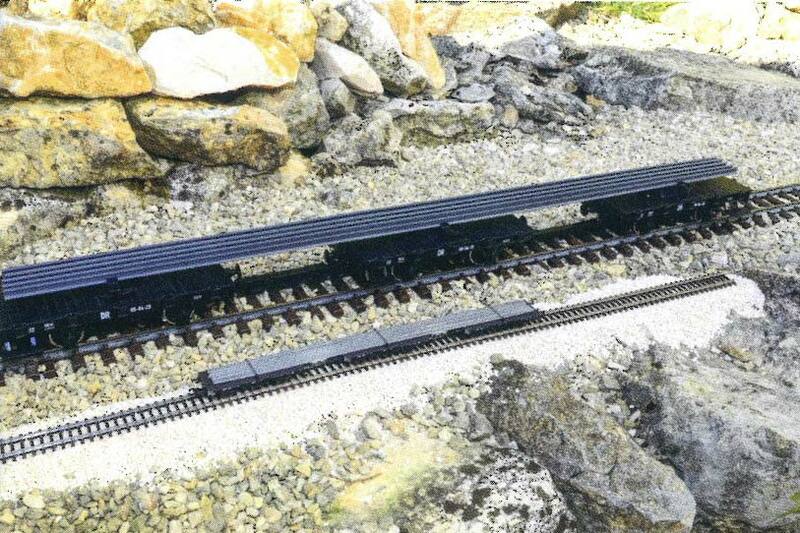 An additional coat of paint would hinder movement of the rails in the sup­ports. Load restraints are mounted on each piv­)ting arm to fasten the five rails to the )ivoting arms of the three car units. The 35.4″ long rails are held in place by approx­mately 0.39″ long pieces of track profile whose rail head has been cut off. At the .wo outer load restraints, any unwanted rotrusions to the exterior are removed. [le load restraints are glued into place with a low viscosity instant adhesive e.g. Bindulin glue). To mount the load re­traints, first determine the position of the :enter rail on the pivoting arm and glue the two load restraints into place. Subse­quently, fit the rail load restraint on the left and the rail load restraint on the right. Finally, the load restraints for the outer rails are mounted. It is important to make sure there is sufficient space between the load restraints. The rails should not be squashed together but be mounted in a way that allows them to move between the load restraints. This ensures sufficient flexibility when navigating curves. If nec­essary, the load restraints should be re­touched slightly using a diamond file. After the disassembled parts of the three cars, including the shortened dummy parts of the substructure have been reas­sembled, the blocks of ballast are painted satin matt black. The dummy brake hoses dismantled at the start of the conversion are attached to both ends of the special vehicle. Brake hoses are not used on the other parts of the car set to prevent them colliding with the cargo. Fully assembled: View from below of the intermediate car with painted addi­tional weight and ball bearing mounted wheel sets. 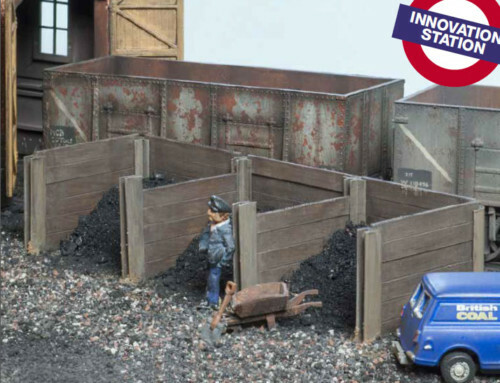 Initial running: The first car of the set is finished and is tested on the tracks along with its small cargo of rails. Final run: The KOf loco goes on a trial run with the new rail car set. The running characteristics of the long car in curves and vitches are awesome.